Dorothy Chaney Estate Auction — Harritt Group, Inc. 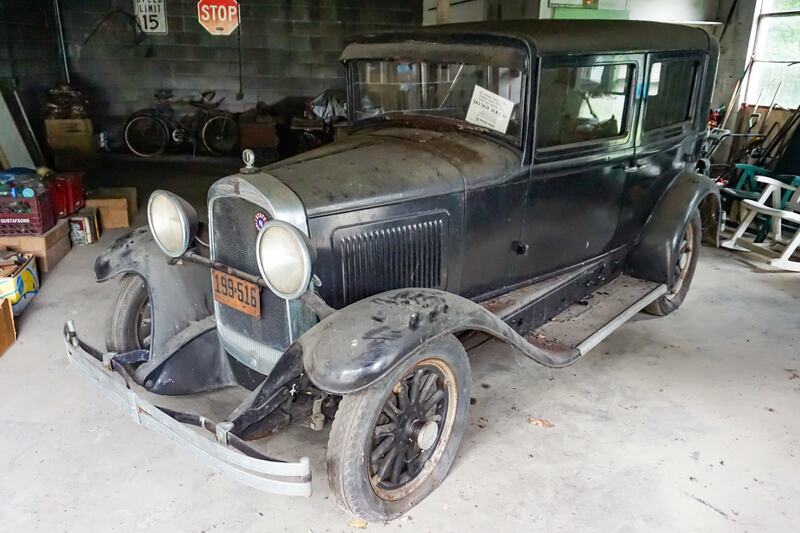 Selling live on site a 1929 Willys-Overland Whippet, Falls City Beer advertisement, depression & carnival glass, oil lamps, pocket watches, hundreds of bottles and jars, quilts, furniture, handicap scooter and more. Should be lots of surprises. Auction located off Hwy. 111 just Southwest of Main Street in New Albany. As-is barn found 4-door sedan Willys-Overland Whippet, stored for over 18 years, 2 owners, includes owner’s manual, extra wheels, parts and Whippet sign. Craftsman 19.5HP turbo cool riding lawn mower with 42” cut. Large selection of Falls City Beer advertising including several bumper stickers, dozens of plastic calendars, posters and more, multiple boxes of Drummond Bros Beer plastic calenders, Billy Beer cans & advertisement, large 1800’s safe w/combination, large selection of 1930’s – 1960’s vintage license plates, vintage bicycles, car emblems, street signs, cast iron tea kettles, sad irons, molds, dozens of oil lamps, quilts, Horton galvanized cooler, DX gas cans, large selection of vintage books, scrap pieces of wood, Cabin Still Bourbon decanter set, Calumet Baking Powder tins, rolling pins, (7+) pocket watches including Keystone, Elgin and Westclox, Swiss made Mickey Mouse wrist watch, Sparrow Agnew wrist watch, sterling silver ring, vintage earrings, Barlow political pocket knives, large selection of vintage political buttons, signs, brochures and more, cigar boxes, Sheriff Atkins Floyd County calendar, wooden sled, Bruce Fox steer head serving tray with carving set, McCormick Bourbon American Hero decanters with unopened and unbroken seals, Indy Car & Elvis decanters, vintage New Albany and Louisville postcards, Owen Lodge New Albany ribbon, comic books, sheet music, Sylvania turn table, Belle of Louisville sign, large wood tool chest, (6) treadle sewing machines and much more. Large selection of vintage glassware including dozens of blue mason jars w/zinc lids, milk bottles, soda & beer bottles, medicine bottles, pink & green depression glass, orange & blue carnival glass, vaseline glass, Shirley Temple creamers, decanters sets, pitchers, apollo glasses, pioneer plates, vases, planters plus many box lots of glassware. Latitudes lift chair in like-new condition, dining room table & (6) chairs, ornate hutch, dinette set, antique oak dish cupboard, iron park bench, iron patio table & chairs, 1960’s retro chair w/foot stool, victorian chair, wash stand set, cedar chests, vanity chair, sofas and more. Kerosine heater, towing bar, wheelbarrow, aluminum extension ladder, large selection of medical chairs and equipment, chest deep freeze and more. Selling contents of large house, garage and barn – should be lots of surprises! From downtown New Albany take Main Street West to straight on Hwy. 111. South 2 miles to right on Two Mile Lane. 1/2 mile to auction on left.